Cook and Sholander have been studying the lives of successful dreamers for years and through their research they identified ten key characteristics for success. They interviewed hundreds of people to find the elements of "Dream CPR." 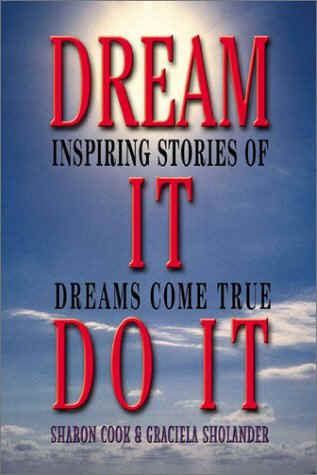 While reading "Dream It Do It," all I could think was: "If these individuals could see their dreams come true, I can also make my dreams a reality." I enjoyed reading the true-life example of Barbara Walters' persistence and was amazed by the resilience Maya Angelou has shown in her life. These questions are all answered in "Dream It Do It." It is not enough to say that you should just do something. Where do you start? The authors present some of the main principles of success by giving examples of effective strategies. They show where the dreamers found their inspiration and at times, this information will surprise you. I was amazed at how Maya Angelou created beauty out of pain. "Dream It Do It" presents the recipe for success and all you need to do is blend these ingredients into your daily life to create the life of you dreams. "Dream CPR" will breathe new life into your buried dreams or will give you the encouragement to continue your current path towards your goals.